When I made myself a top recently, I made the leftover fabric into some shorts for The Girl. 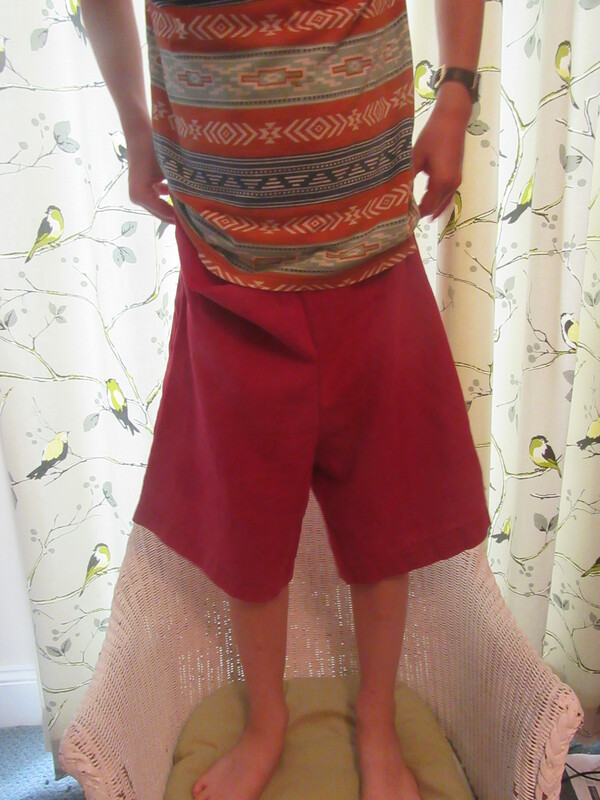 So, when I then had some more of the same fabric, but in red, left over from making The Boy a Semper Top it seemed only natural to make The Girl some more shorts. I realised that if I didn’t cut the waistband out of the red fabric, then I would have enough of it left to make a theraputic neck pillow for The Boy (who is jealous of his sisters and has requested a red one with black elastic handles). I figured I could get away with using this knit fabric as it’s quite thick and stable. So, the waistband for the shorts is made from some grey ribbing which ties in with the grey bias binding edging the pockets (originally bought to finish the hood of his Semper). I wish I’d got the edging sewn down as neatly as I did last time, as red on grey shows up much more than navy on dark purples, but them’s the breaks. Now I just need to find the purple shorts, which went AWOL less than a week after I made them. Sigh. I offered to make the girl a swishy skirt out of the leftovers of my latest coco, but she chose shorts instead. I thought she might want the Domi short pattern (as used on her pyjamas) shortened, to be a similar length to her shop bought ones, but she chose to keep them long. She also kept the patch pockets (rather than opting for the circle openings) and designed them with the reverse, slightly stripey side of the fabric, on the pockets and waistband. One quick and easy make and they’re are a hit, especially as the fabric feels “silky”. http-equiv="X-Frame-Options" content="DEI wanted to show you the last thing I made before I got my new sewing space, some Domi Shorts. I was really pleased to find the Sofilantjes Pattern range when someone from the Stashbusting Group posted a pic of a Semper Sweater. There are boys/unisex patterns, in everyday style clothes and the size range on the patterns is huge (12months – 14 years). Plus being based in the Netherlands (the patterns are available in either Dutch or English), there are samples made in the bright patterns that my son loves. Anyway, to start with I bought the Semper sweater (which was on offer at the time) and the Domi sweatpant pattern, as it was perfect to make the long shorts I had in mind to use up the rest of the cogs and gear fabric and should also come in handy when I have to replace the star trousers. Yup, this photo is awful. I can’t take another one though as I’ve given them away. They came out too small! This may well be as I was going pretty fast when I made these and not stopping to think. 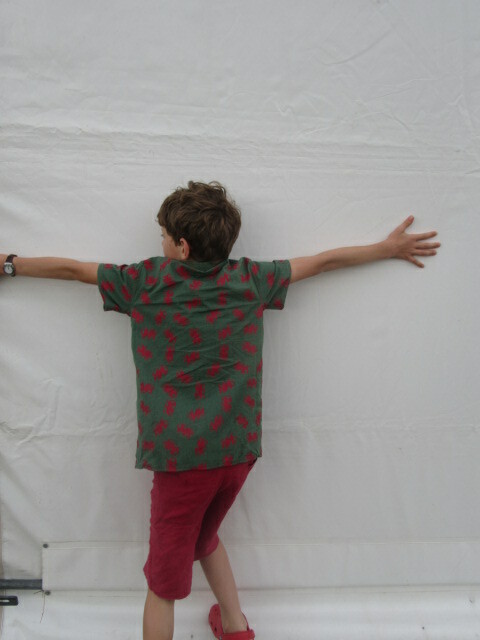 I measured the boy, waist, hip and inside leg. His hip size fell in age 7 range, the inside leg and I think the waist too came out as age 10. This should’ve rung alarm bells as my boy is a straight up and down beanpole, his waist is not 3 sizes bigger than his hips. However, the pattern said to go with the hip and inside leg measurement (presumably as the waistband is elasticated) and he is skinny for his age, so I made them in the size 7, but cut to the length of the size 10 (which is still always going to be shorter than a size 10 as you loose crotch length). I made them the 3/4 length but without the cuff, hoping for a below the knee long short look (that would grow with him into above the knee shorts!). Anyway, they just fit but only just in a slim fit kind of way and were above the knee. On reflection, the pattern did state that they’ll fit more loosley around the hips of boys as they tend to be slimmer there than girls, so probably I should’ve made a size 10. I was a bit frustrated, as I love this fabric and don’t have enough left for a remake, but I’ve found a good home for them and next time I make something from this company I will remember that they’re not drafted huge like a big 4 pattern! The shorts themselves were a quick make, the pattern is straightforward and the instructions are clear. I love the curved pocket openings (although as stated in the pattern, if you choose this option they don’t fit much in) and the eyelets I used to thread the cord through having helped them to come out looking professional. I was pleased with the lime green and teal combination too, I’m glad they’ve found a good home! Ohh, and let me tell you about mynew sewing space. The Great Sort Out is still going on, but now that we’ve banished the kids up to the attic (in separate rooms), their old room is our new spare room / sewing space / work from home place. I have repurposed an old table to be my sewing table and tried to get organised with a home made spool holder and some tubs from IKEA and I’m really pleased with my new lamp. The hand cranked adjustable height table on the other side of the room is from IKEA too, perfect for when LSH is working from home as he can sit or stand at it and help prevent back issues. When he’s not using it it’s great for taping PDF’s together and cutting out patterns. I also found an old pile of mending, including 2 pairs of age 3-4 trousers and a coat, all now mended and passed next door for their 2 year old to grow into, along with some trousers for LSH. Speaking of which, LSH has been using the new space for sewing too, raiding my scrap pile to make a new rag coat for the latest morris side he’s joined. The Girl had great fun chasing him round in his new coat trying to spot where all the fabric was from, including hte hidden fairies. Hello, hello, testing, testing, 1, 2, 3, anyone still there? I’m afraid this blog has got a bit rusty and out of use in the last few weeks as we have been here there and everywhere. However, I’m pleased to report a new outfit has been sewn and worn this past week. Hurrah. So I’m going to spray everything liberally with WD40 and see if I can get the cogs turning again, because I really want to show you all this one. Way back when at the beginning of the summer, when we were camping in Wales, I stumbled across the excellent Wheeler Fabrics shop in Wales. Turned out that amongst it’s pretties there was a lot of fabric from the Organic Textile Company hiding away in their basement. Yes, I was in the sister company to the place where I bought some sweatshirt fabric and a bundle of other goodies online. Honestly, I had no idea we were camping so near to such a place! 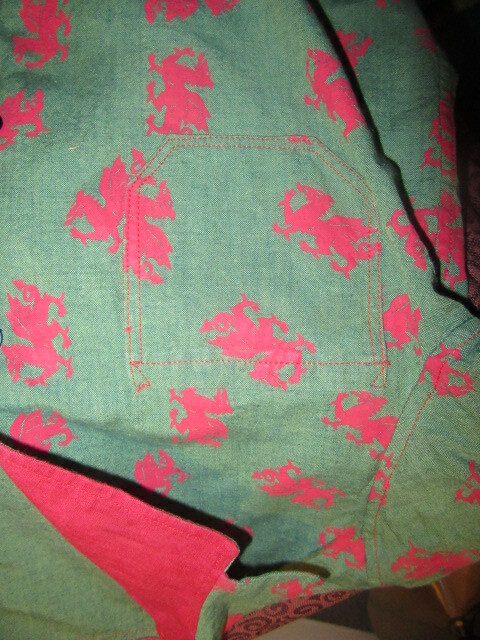 Anyway, one* of the fabrics I bought was a metre of this welsh dragon print cotton. I didn’t like the look of it online, but once I saw it in the flesh I knew it would make an excellent shirt for The Boy. Especially as the “original” shirt that I made him is now getting a little on the short side. So I rolled out Simplicity 4760 again. Turns out last time I cut the pattern pieces along the large size line (the choice is S/M/L), so I just added an entirely unscientific 3″ to the length (an average of my guesstimate of 2″ and The Man’s 4″), as the skull and cross bones one is still plenty wide enough on him (partly I think this is Big 4 Sizing and partly that The Boy is a beanpole). The make was pretty uneventful except that I didn’t have enough fabric left to cut the facings. 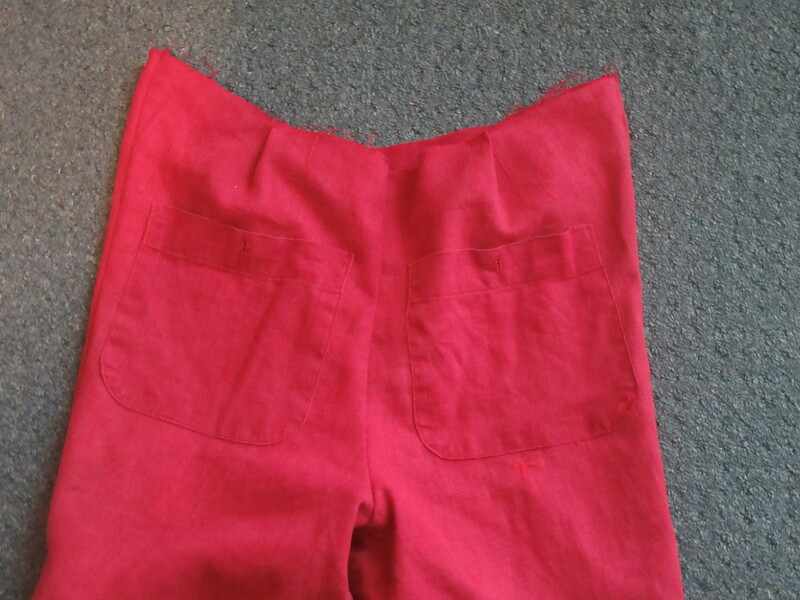 However, I did have some red linen trousers of mine that had got put on the mending pile and then left there because I’m really bad at mending when I realised that the entire seat was almost threadbare and could give way spectacularly at any time. I’d had a vague thought about hacking them into shorts for the boy. Better do that first then so I don’t use the wrong bit of fabric. I wanted to reuse the existing hems. The trousers were wide legged so I thought there’d be enough space to fit the crotch in the bottom of the legs (I don’t think I could get away with this usually). So, I used some existing shorts of his to measure from the bottom of the trousers/shorts to the bottom of the waistband, added seam allowance, and cut them off. I fixed a small hole by putting a scrap behind and zig zagging over the top. 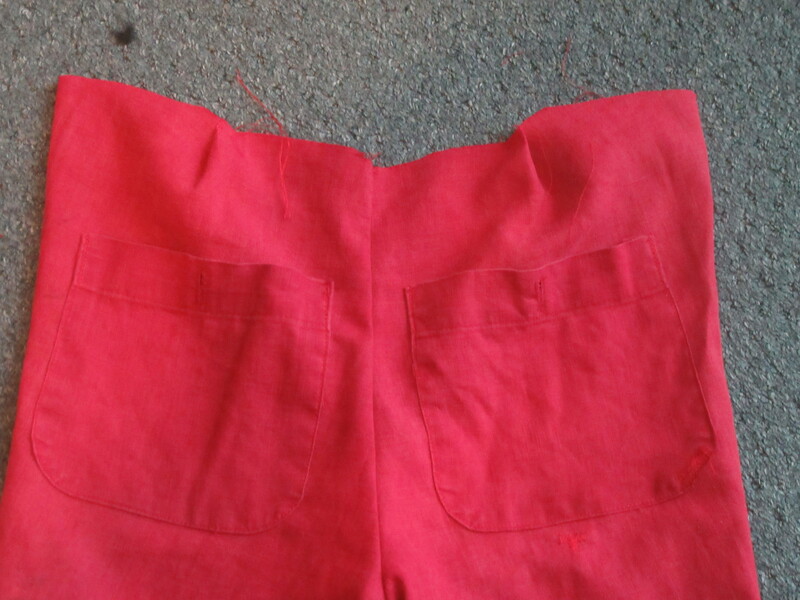 Then I used the Simplicity 4760 pants pattern to trace the front and back crotch curves and cut them out. Then I sewed the pieces together and got him to try them on. Hmm, they’d be fine as girls culottes, but unsurprisingly they’re too baggy at the hem for what I want. 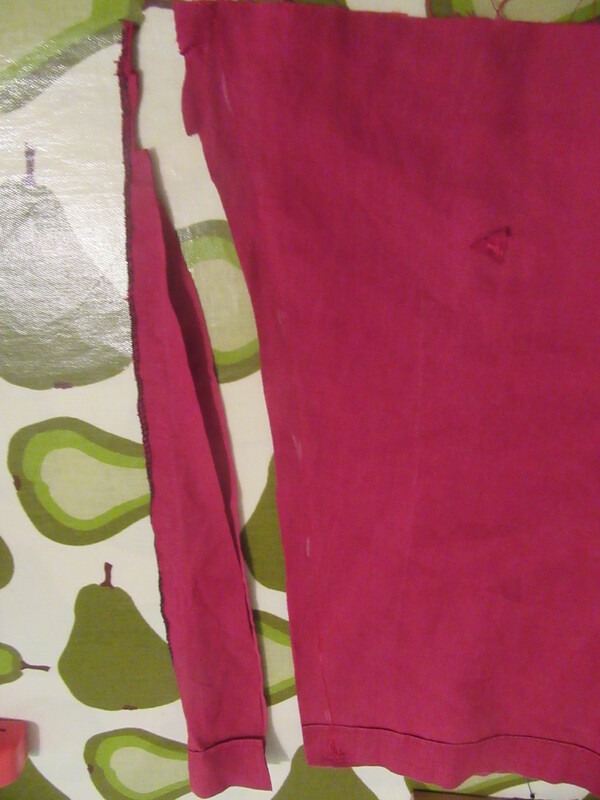 So I cut an unscientific wedge shape of each side (hopefully evenly), re sewed. 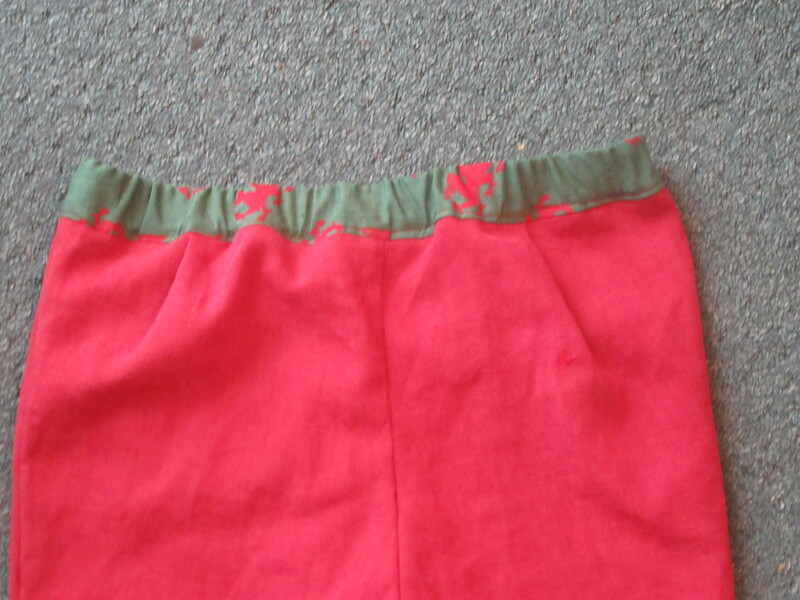 Then I put a couple of pleats in before adding an elasticated waistband made form the dragon fabric. hmm, surely they arent supposed to look that curvy in the waistband? 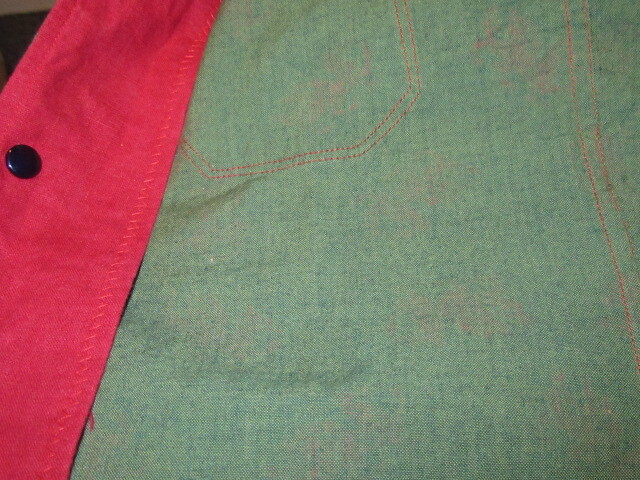 Oh, and I unpicked and reused the back pockets of the trousers. I did consider front pockets, but as I’m not sure how much wear and tear this old fabric will stand up to I decided I couldn’t be bothered. So that was how I remade my trousers into shorts. Not sure if it’s was the “right” way of doing it, but it worked. Anyway, where was I. Facings for the shirt. 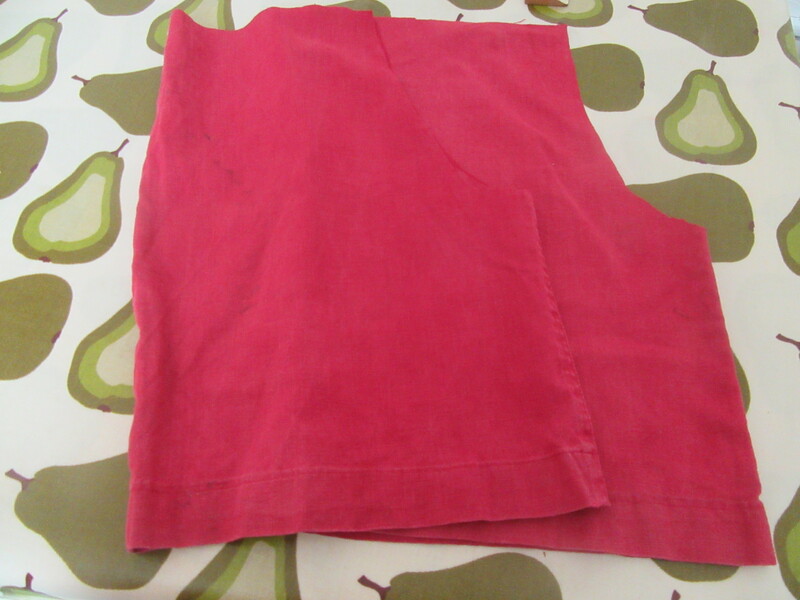 Now I don’t have a long enough piece of red linen left to cut them out! Grr. So I pieced some bits together, and used the inside, which was less faded and a better match for the red dragons. (Well, mainly I used the “wrong” side, 1/2 of one facing is accidentally a lighter red than the rest of them). Oh, and I was finishing this sewing the morning we were going away. The Man was very patient with me. 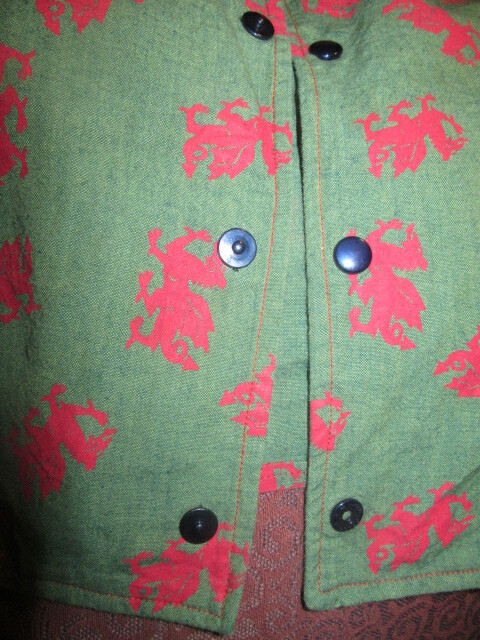 I then handstitched the inside of the collar down in the car. As I did this after I topstitched around the front facings/hem/underside of the collar in one go (no idea why, seemed a good idea at the time), I had a couple of messy bits I had to fudge, but the boy kindly told me they made it look homemade. Anyway, they’re on the inside where no-one will notice and I don’t think anything is going to unravel. I didn’t have time for buttons, so I took my snaps and prym plier tool thingy that I got for my birthday. I only had enough of some navy blue ones, which was a shame as they don’t really match, but I decided The Boy would rather have it finished than matching (plus he doesn’t see colours like most of us do so its unlikely to bother him). Inserting snaps in a car on a motorway (in the passenger seat I hasten to add!). Hmm, maybe not my best idea. One is slightly off line and one is upside down (i.e. press stud facing outwards) so doesn’t do up. Luckily it’s the bottom one so he can still wear the shirt. 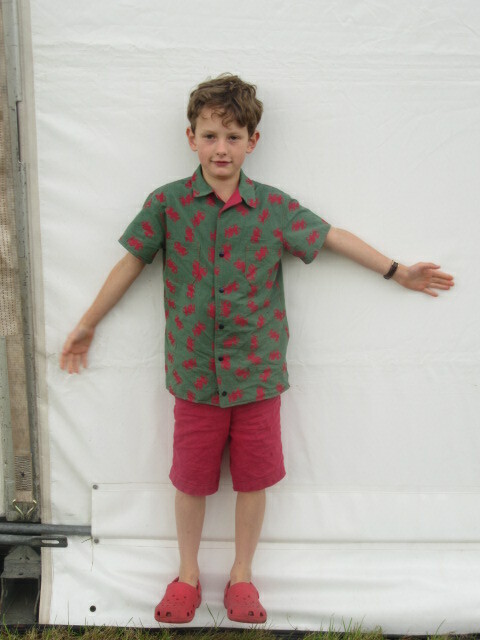 Anyway, the boy didn’t mind, he had the shirt on before the car journey was finished and it was much admired by everyone upon arrival at our destination (Shrewsbury Folk Festival). The question is, does anyone reading this have any experience of trying to remove them? Will it ruin my fabric or is it doable? And is it worth buying a whole new pack of snaps just to replace half of one? Anyway ballsups mishaps or not this outfit is definitely a win. And a great souvinear of a lovely holiday. I have also decided to make it my Made Up Initiative pledge. Which is kind of the wrong way around as I pledged after it was finished, but as Karen is happy for people to donate and not make I’m sure she won’t mind! And I was away when the initiative was launched and I’m still catching up on all the blogs I follow. So my conscience is clear! Right, enough burbling from me, hope you had a great summer and that your pledge sewing is coming along nicely if you’re taking part. *Holiday fabric shopping comes under the heading Souvenir, and not Stash Acquisition, so is guilt free. Fact.